This origami hat is a whimsical accessory to the origami skull previously presented at Origami Spirit. It is also part of our series celebrating the Day of the Dead . In English speaking countries a “sombrero” is a hat with a brim wide enough to cast a shadow over the head, neck, and shoulders of the person wearing it. This particular hat style is characteristic of Mexico, and it’s one of its national and cultural symbols. In Spanish-speaking countries, the word “sombrero” is a name for any hat with a brim. The word ‘sombrero” derives from the word “sombra”, meaning “shade” or “shadow”. A sombrero then is “that which provides a shadow” or protection from the elements. 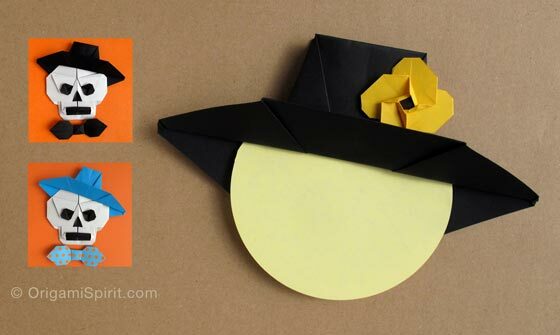 Make your origami skull and make your origami hat. Let us then rejoice in the living memories of our loved ones who have passed before. The following video will demonstrate how to make this origami hat. The origami hat is made made with a square piece of paper. A 6×6-inch (15x15cm.) square is perfect for learning this model. If you are making a hat as an accessory for an origami skull, use a square the same size as the square used for the skull. The finished origami hat show both sides of the paper. It is ideal to use paper with the same color on both sides. The hat is flat. To flatten it after folding leave it under a book overnight. Leyla, Thank You so very much for this video! Super cute, it is the perfect finish for the skulls! I am so tickled! Sensational. Thanks for teaching so many great origamis.